Euclidean geometry is the geometry that everyone learns and uses throughout Middle School and High School. In general, geometry is the study of figures, such as points, lines and circles in space. Euclidean geometry is specifically any geometry in which all of Euclid’s postulates and axioms hold. Axioms and postulates are the beginning of reasoning, they are simple statements that are believed to be true without proof. Assuming Euclid’s axioms and postulates found in his book Elements, the rest of Euclid’s classical geometry could be deduced. However, Euclid’s fifth postulate, the parallel postulate, was disconcerting because it was lengthy compared to the rest and not necessarily self evident. Many other ancient mathematicians were dissatisfied with Euclid’s fifth postulate. They thought that it was presumptuous and tried to prove it using lesser axioms or replace it altogether with something they thought to be more intuitive. But their proofs always included an assumption equivalent to the parallel postulate, so for centuries the postulate was assumed to be true. Centuries passed and the postulate remained unproven; however, development to understand Euclid’s postulate continued into the eighteenth century. Perhaps the most well-known equivalent to the parallel postulate is Playfair’s Axiom, which states “through any point in the plane, there is at most one straight line parallel to a given straight line.” Arguably one of the most influential mathematicians, Carl Friedrich Gauss became interested in proving Euclid’s fifth postulate. After attempting to prove the postulate, he instead took Playfair’s Axiom and altered it, creating a completely new postulate. Gauss’ new postulate stated “Through a given point not on a line, there are at least two lines parallel to the given line through the given point.” With this Gauss had unearthed a completely new space that today is called hyperbolic geometry. However, he chose not to publish any of his results, wishing not to get caught up in any political strife. The work was later published by Johann Bolyai and Nikolay Lobachevesky, who both had academic ties to Gauss. Shortly after this discovery another type of Non-Euclidean geometry was discovered by Gauss’ student Georg Friedrich Bernhard Riemann. Riemann looked at what would happen when you altered Playfiar’s Axiom in the opposite direction than Gauss. Riemann’s alternate postulate is stated as follows, “through a given point not on a line, there exist no lines parallel to the line through the given point.” With this, what is known as elliptical or spherical geometry was discovered. Spherical geometry. Image: Anders Sandberg via Flickr. Spherical geometry provides a somewhat simpler model then hyperbolic geometry. Anyone who has ever attempted to wrap a basketball in paper understands that there are some discrepancies between the two surfaces. For instance, triangles behave quite differently than they do in Euclidean geometry. In hyperbolic space, the angles of a triangle add up to less than 180 degrees, and in spherical space, they add up to more than 180 degrees. Spherical geometry also has other inconsistencies with Euclid’s initial assumptions other than the parallel postulate. In Leonard Mlodinow’s book Euclid’s Window, the author describes how Riemann’s space was inconsistent with other of Euclid’s postulates. For instance, Euclid’s second postulate states that “any line segment can be extended indefinitely in either direction.” In spherical space this is not true; the lines, or great circles, have a limit to their space, namely two pi times the radius of the sphere. Mlodinow describes how Riemann saw this postulate as “only necessary to guarantee that the lines had no bounds, which is true of the great circles.” Also, Euclid’s first postulate became less clear, “Given any two points, a line segment can be drawn with those points as its endpoints.” This postulate can be used to easily describe whether a point is between two other points. However, on the globe, choosing two points on the equator such as Ecuador and Indonesia it is difficult to say whether a third point, Kenya, is “between” them. The problem is that there are two ways to connect the points, one passing over North America and another passing over Africa. For much of our day to day lives Euclidean geometry works great, because on a local scale we appear to live on a flat world. I can go to a soccer field and trust that it will take four 90 degree turns to walk around the perimeter, or that the Pythagorean theorem will work to describe the path between opposite corners. But looking at a larger scale, the surface that we live on is spherical and has different properties than the flat plane. It is interesting to see how Gauss and Riemann, going against the grain of conventional mathematics, led to new and vast fields of undiscovered mathematics. To me, this shows how mathematics is just as much an experimental science as physics or engineering. These new discoveries of mathematical spaces made possible Einstein’s physical description of the space in which we live. Mlodinow closes his section on Gauss and Riemann saying, “though thoroughly remodeled, geometry continued to be the window to understanding our universe.” Even though the properties of these new geometries differ from classic Euclidean geometry and may have more or less practical use, they are just as important. From Euclid up until Gauss, mathematics was largely pragmatic, but the discovery of these new geometries highlights how math can be appreciated for its own sake. This entry was posted in European mathematics, Geometry and tagged Euclidean Geometry, gauss, geometry, Non Euclidean Geometry, Riemann, Spherical Geometry on November 5, 2014 by adamvicioushoward. It’s kind of embarrassing to admit this as a 24-year-old college student, but I have an imaginary friend. His name is √(-1). He doesn’t keep it as real as some of my other friends, but he’s always my main dude in some of the more complex friendships I get involved in. He’s got a pretty interesting life story, and he’s exceptionally old and wise (imaginary friends never die). He was birthed by the Greek mathematician Heron of Alexandria in the first century A.D. He had a rough childhood (neglected and completely ignored by his father), partially because no one understood him. People ignored him, calling him useless. His name was even meant to be derogatory at one point.4 √(-1) met Gerolamo Cardano (coined the term “imaginary”), his first true friend, in 1637. After Cardano passed away, √(-1) was lonely until he was accepted into a new circle of friends during the 1700 and 1800s: Leonhard Euler, Carl Gauss, and Caspar Wessel. Although his new friends were a little on the nerdy side, they helped restore his personal image – eventually helping him to become a internationally known, and well respected celebrity. Image: Matheepan Panchalingam, via Flickr. The Italian engineer and architect Rafael Bombelli started searching for solutions to cubic equations in 1572, and during that time, he started defining some guidelines for using imaginary numbers.5 At this point, most mathematicians didn’t want to believe these numbers were significant, or that they even existed. Bombelli’s “wild idea” – that you could multiply imaginary numbers and end up with a real solution, didn’t sit well with fellow scholars. In fact, Bombelli didn’t even think imaginary numbers could ever have a true purpose, he just viewed them as a useful artifact to solve his equations. Later on, along came Leonhard Euler, a math rockstar in many people’s eyes. Euler really takes the cake here for noticing one of math’s more bizarre imaginary (in a math sense) equations. He showed the world how closely i, e, and π are related and further convinced the math community that i was relevant:2 Today, this is known as Euler’s identity. In 1842 Carl Gauss did the impossible. He actually defined imaginary numbers (although Cardano coined the term “imaginary”.). Later on, once the reality of i was more widely accepted, our understanding mathematics expanded greatly. Euler, Gauss, and Wessel (1700s and 1800s) utilized imaginary numbers and led to the creation of complex numbers, which have a vital importance in math/science today. A basic graph showing real and imaginary points making up a complex line. Image: Public Domain. Let me simplify this for you – What this means is that every polynomial equation has roots. Specifically, a polynomial equation in “x” with maximum exponent “n” will always have exactly “n” complex roots. Imaginary numbers are more prevalent in the world than you’d think. Without the electronic circuit theories conceived from imaginary numbers, I wouldn’t be typing this blog post, and more importantly, you wouldn’t be reading it. When we plug something into an electrical outlet, we just expect our electronic devices to receive power. In fact, I bet you plugged in your laptop charger today and didn’t even think twice about it. What does exactly does this AC power have to do with imaginary numbers? Everything. 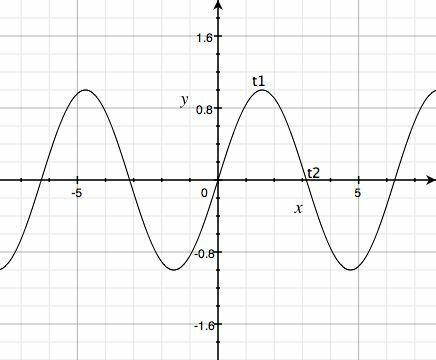 Basic sine wave showing only real voltage. Image: Public Domain. 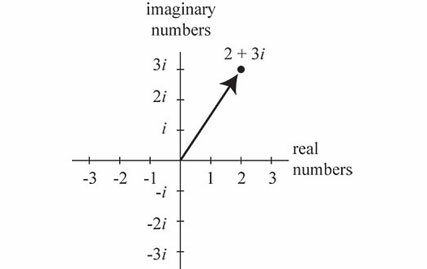 All in all, you can thank Bombelli and Euler for introducing imaginary numbers. Not only do they make math more confusing, but they also have many crucial applications in the world around us today. This entry was posted in European mathematics, Practical Math and tagged Euler, gauss, how to not get electrocuted, imaginary numbers on November 5, 2014 by k1ngdr3w.